The theoretical formula for clay is Al2O3 2SiO2 2H2O, an alumina-silicate, but none are that pure and uncontaminated. There are many technical characteristics that define a material as a clay but, for ceramics, the primary characteristic beyond the alumina and silica content is the fact that they are composed of very small flat platelids with a resulting very large surface area with microscopic water between them so they slide on one another and additionally tend to hold their shape. Additional properties of clays are 1) harden when dried and become permanent when fired, 2) shrink during drying and firing, 3) refractory (resist softening at high temperature), 4) heat, sound and electrical insulation. All clays come from decomposed rock and there are thus many somewhat ill-defined variations. The broadest classification is primary clay versus secondary clay which refers to how close they are found to where they were originally formed by weathering. Action by glaciers, water, wind and earthquakes are responsible for movement and changes. The closer they are found to their origin, the fewer contaminants to the theoretical composition and the larger the particle size (microscopic regardless of the grind size) and the less plastic. This is the main primary clay, generally being white and the most refractory due to the minimum amount of contaminants that might effect those properties. Due to lesser weathering relative to other clays, kaolins are also coarser. Some kaolins are, however, technically actually secondary clays such as Georgia and Florida kaolins but they still possess the basic characteristics again due to lesser weathering action. Formed from the decomposition of volcanic ash, bentonite is classified as a very fine-grained primary clay. Although chemically like clay, technically its physical properties differ. It is so fine that it is colloidal. It cannot be used by itself because it swells excessively when wet, turning to a gel, and because of its stickiness and very high shrinkage. It is used in clay bodies in very small amounts (1-3%) as a plastizer and in glazes to keep them in suspension due to its swelling and small particle size. The remaining secondary clays are often broadly differentiated by their refractoriness but there are so many clays misclassified and the terms so ill-defined that only the following can be offered. All are found in abundance world -wide. Ball clays are the finest particle-sized clays, are the most plastic, most sticky, and are characterized by a high rate of shrinkage due in part to their high organic content which burns out. The small particle size makes them excellent in suspensions such as casting slips and as suspending agents in glazes. They have a low iron content, usually firing to a pale off-white color. A poorly defined categorization generally referring to non-kaolin or ball clays that are usually about as refractory as the ball clays but with slightly more iron content and larger particle size. Traditionally they have been used to make bricks and refractory materials. They fire buff to light brown and have reasonable plasticity and dry strength. However, there are several clays called "fireclay with high iron content" that fire quite red, especially when fluxed. A general term for plastic, refractory, secondary clays which are neither as fine-grained as ball clays nor located as deep-seated as fireclays. Generally they vitrify at a slightly lower temperature than fireclays and fire buff to light brown. Traditionally, they have been used to make pottery. The usage is really the main differentiation between a fireclay and a stoneware clay. In current usage, the terms are interchangeable for all practical purposes. Again, a broad and ill-defined categorization. Historically it has been used to describe the clay used to make "Earthenware" cooking and functional pottery which is lowfired, porous and red. The differentiation from fireclay and stoneware thus is a lower refractoriness, greater fired porosity and a higher iron content. Usually, there is also a higher content of other contaminants. However, the refractoriness of some clays referred to as fireclays and some of those referred to as earthenwares overlap and some fireclays called "high iron content" may be as red as a light earthenware. The term terracotta has at times been used to describe a red earthenware clay. The name comes from its use in making saggers which can withstand repeated heating and cooling. Fires a buff to light brown. Often ground courser than other clays. Could be simply viewed as a fireclay that resists repeated heatings and coolings better than some other fireclay. 6-Tile:A very white Georgia clay conducive to translucency. Very plastic with a small particle size. Calcined: A clay that has been fired to drive off combined water resulting in reduced shrinkage. Sometimes used in a glaze to assist adhesion before firing and fit after firing. EPK: Edgar Plastic Kaolin from Edgar Florida. The most commonly used kaolin due to its availability. Can usually be used in a glaze in place of any specific or non-specific kaolin. Technically not particularly plastic in spite of its name. Fires cream white. Grolleg: A very plastic and white primary clay from England. Used in premium translucent porcelains. Ione: A California kaolin, not particularly plastic. Fires a grey-white, it is used mainly as an inexpensive substitute for the kaolins in non-porcelain clay bodies. Mullite: Loosely include here as a kaolin, it is a needle-like crystal which lends strength and thermal shock resistance to clay bodies, especially in crucibles, kiln furniture, and industrial refactories. See Kyanite. Velvacast: A non-plastic delaminated very white clay used to add green strength. Amador:A plastic, light buff California clay. Barnard Blackbird: A high-iron and manganese content self-glazing slip clay vitrifying at cone 4 to 10. Fires to a brown-black color, darker at high temperatures. Greenstripe: A plastic, somewhat sticky light-buff California clay. Missouri: A light buff firing clay from Missouri with somewhat larger particle size providing great strength and ‘tooth." Usually used in a coarser grind in sculptural bodies. Red Art: A dark red clay from Ohio with a lower melting temperature. Kentucky OM-4:The most widely used ball clay in clays and glazes. Old Mine Number 4 has been depleted and the clay is now a calculated blend of several ball clays. Contains more organic material than some other ball clays. 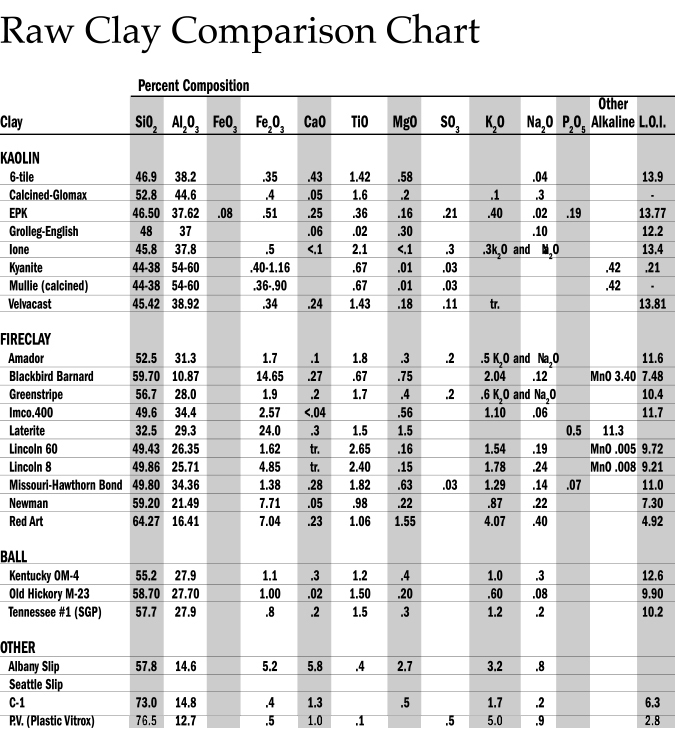 Tennessee #1: Lighter than OM-4 and smaller particle size.